If you like to be warm but want a lightweight comforter, try a comforter with a 600 fill power, duck down and a cotton shell. The tread count needs to be at least 210 to prevent the down coming out through the weave.If you particularly want a down comforter with a white shell, make sure the down is white goose down. White shelled comforters with grey down can look dirty. If you are allergic to down or feathers – do a search for down that has been washed many times. It’s not the feathers that cause your allergy, it’s the dust on them. Multi-washed down eliminates this problem. Where to Buy Comforters Online? As the name suggest, Bedding and More’s primary focus is bedding. Besides comforters at inexpensive prices they also sel bed-in-bag sets, quilts, pillows, blankets flannel sheets and more. Before we start, let’s make sure we’re all talking about the same thing! Bedding sizes differ from one country to another and so do the names for bedding items. In America, a comforter is a warm bedcovering. In Britain, a comforter usually refers to a baby’s dummy (which is called a pacifier in the USA). An American comforter is a soft, flat bag made in a decorative fabric and filled with artificial or natural material and often lightly quilted to hold its’ shape. The nearest British equivalent to a comforter is an Eiderdown. US comforters are usually ready to put straight onto the bed, like an Eiderdown, but they may be put into a cover to keep them clean. In America, that cover is often called a duvet. In the UK a duvet is the soft, flat (usually plain cotton or polyester) bag, filled with artificial or natural material and often lightly quilted to hold its’ shape. The duvet then always goes into a cover, which is called the duvet cover. Down is the name of the small, soft, fluffy feathers that baby birds are covered with. Down is also found under the outer feathers of adult birds. It’s important to know which kind of down is filling the comforter. Make sure the filling is 100% down – you don’t want it mixed with quills or adult feathers – that will compromise warmth and fluffiness. Comforters with ordinary feathers and not down don’t mention the fill power. As a general rule, the further north the down comes from, the better quality it will be. If the comforter is baffled, it means that it has been stitched straight through, horizontally and vertically, creating square ‘boxes’ or baffles. That keeps the down evenly distributed across the comforter. Avoid comforters that only have all straight lines – either only horizontal, or only vertical. The down will always ‘clump’ at one end, leading to cold spots and a lumpy comforter. The fill power is how many cubic inches are filled by each ounce of down. A 50oz comforter would have a total weight of 50oz of down. The more cubic inches an ounce of down occupies, the more air it will trap and the more warmth the comforter will have, per ounce. The higher the fill power – the better the quality. The shell is the outer surface of the comforter. The most expensive are covered in silk jacquard. The shell can also be 100% cotton, sateen cottons, cambric cottons, cotton chintz, chenille and velvets. It’s advisable to put a cover on a down comforter, to keep it clean. Down comforters may be washed but only once every few years and only then, if really necessary. may smell pungent. This is natural and will disappear once it’s dry. Store your comforter in a dry place as mildew can ruin a down comforter. Make sure the comforter is completely dry before storing in a cotton bag – never plastic. This is another way to avoid the feather allergy. 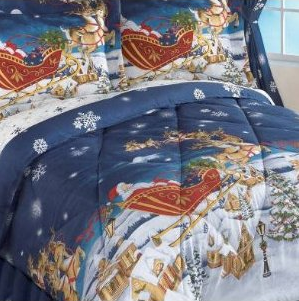 These comforters are great for children as they are easy to wash. A good quality synthetic down comforter is comparable to a 550 fill power down one. Comforters with a cotton shell and 100% cotton fill are medium weight, since cotton is heavier than down. These are only good for warm weather, as cotton is not a great insulator. These are perfect for anyone with allergies as dust mites cannot live on silk. Both the shell and the filling are 100% silk. This gives a beautifully soft and luxurious comforter. Silk is also able to adapt to changes in your body temperature – it you’re hot it feels cool and when you’re cold it’s cosy. A perfect all-rounder and they don’t have to be the most expensive option! Shop around for the best deals.